3. Properly fishing that fresh bait. Our ability to perform in all three of these critical areas is why so many of our customers continue to fish with us. While we use good tackle, operate our boats safely, and treat our customers with a warm friendly attitude, few can match us in the three critical points given above. And that ability comes from doing it for 25 years! Miss any one of these three factors and there's no way you'll catch a limit of stripers, let alone one of the big ones! The value of a good striper guide is his knowledge of Lake Norfork and how to locate the stripers. Since striped bass travel in schools, and since they move around quite a bit, finding them is not always easy. 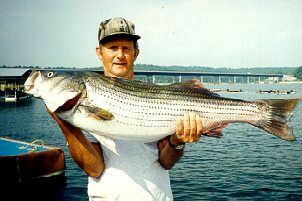 When heavy rains or seasonal changes cause Lake Norfork to cool off, the stripers start moving. When the water heats up in the summer, they move again. They feed on shad, a bait fish which also travel in schools. Where the shad go, the stripers usually follow. However, if the shad go somewhere the stripers find uncomfortable, the stripers move off until they are hungry, then move in to where the shad are, feed, then move out again. 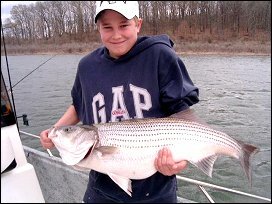 Sometimes the striper and shad schools move around a great deal. Other times they stay in the same place for weeks. It all depends on water temperature, oxygen levels in the water, and the plankton populations the shad feed on. As the food chain changes and moves, so do the stripers. While at the top of the Lake Norfork food chain, these big fish can only follow the shad, which depend on the plankton. At Breckenridge we've been following shad and stripers for 25 years. For any given condition, for any time of the year, we have a good idea of where the stripers will be! As the water temperature and other conditions change, we know where to go, how deep to fish, and what bait to use. Once he's got you on the fish, a guide has to use the best possible fresh bait, and he's got to know how to fish that bait. At Breckenridge we catch our bait fish fresh every day. We have the right equipment to keep that bait alive and active. Shad are very difficult to keep alive. It takes the right amount of oxygen in the water, the right water temperature, and a few other steps to keep them fresh and alive. This is as important as knowing where the stripers are.